The fields go on forever. The breeze is clean and brisk and refreshing as it comes off the lake. The rock in my hand is smooth and perfect for skipping and when I toss it, I get three hops before it sinks. “Want to see if I can get it all the way to the other side?” I ask, turning to her. I frown because she’s not looking at me. Instead, she’s sitting on her knees, looking away towards the mountains. “We could go, you know.” She looks back at me, her face streaked with tears. They’re still flowing, collecting at her jawline and dripping onto her skirts. I drop the stone I’d just picked up and go to her. I shake my head and lean forward, kissing her forehead. Even now, she’s beautiful. Her skin is so pale that sun will burn it if she’s not careful. I run my finger along the faint blue line of a vein in her forearm the way I also do when I’m fascinated by her. Her fears are almost endearing in their simplicity, but I know better. The Union will stop them dead cold in Washington. She hugs me from behind. Her tears soak the back of my shirt and it makes me irritated. Why does she always have to blow everything out of proportion? The war is close but not that close. At night, if its clear you can almost see the fires, but that’s all. Washington will hold. I turn but she’s no longer there. The field is gone too and the breeze has turned hot and fetid, thick with the smell of vomit and blood. I’m coughing, desperate for air. I’m on my back and I can’t see, I can’t see! “Easy,” someone tells me. It’s a man, not Lia. He’s got my hand though, massaging the palm to wake me up. Kat. It’s Kat, I know his voice. I’m not back at home and I’m not with Lia. She’s gone, it’s all gone now. I’m in the trenches of Baltimore. “Here,” says Len. I know his voice too. I remember now, I’d been wounded by the shells and inhaled too much smoke. My right leg is itching horribly and I’m suddenly very afraid they’ve removed it. “No, and we ran out of prosthetics months ago,” Len answers instead and peels away the darkness. A bandage is lifted away and I stare up at a pale gray sky. I stare into it, uncomprehending until I realize its morning. I’ve lived through the night, survived the attacks and our mad charge across No Man’s Land. “You don’t have a girlfriend you fool,” Kat says, but there is a note of amusement in his voice so the comment doesn’t sting. Shiod goes right on anyway. “Yes,” Len says and finishes with my face. He turns his attention on my leg and the itching begins to go away. Shiod leans over me until his face is obscured. “Oh,” Shiod says and I hear him get up and walk away. I do not grasp the situation quickly but slowly, a sense of loss takes me. Vanmere is not coming back. I can still see him, wide-eyed and tripping as we go over the top of the trench. I see him lag behind, running on his thick legs. I think I even remember him shouting for me to wait. To wait. Please Tommy, wait for me. I shut my eyes and wait for the dream to end, if it is a dream at all. I want to go back to the lake and remember Lia with her flowing black hair, so long she often sits on it. Her face was not as beautiful as some perhaps but to me, she was everything. We fall silent and I turn my gaze back to the sky. The clouds are almost gone and so the rain will not return. I find my breathing is easier so Len must have fixed that. I shut my eyes and inhale deeply. For just a moment I smell clean, lake-side air and think of the mountains. 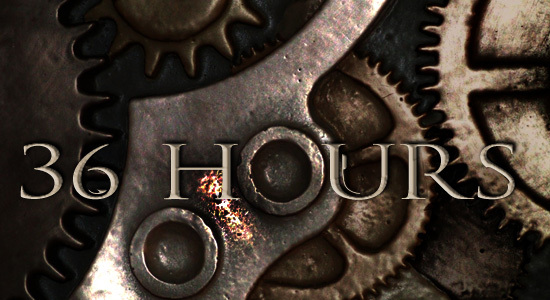 This entry was posted in 36 Hours, Original Fiction, Science Fiction, Steampunk. Bookmark the permalink.